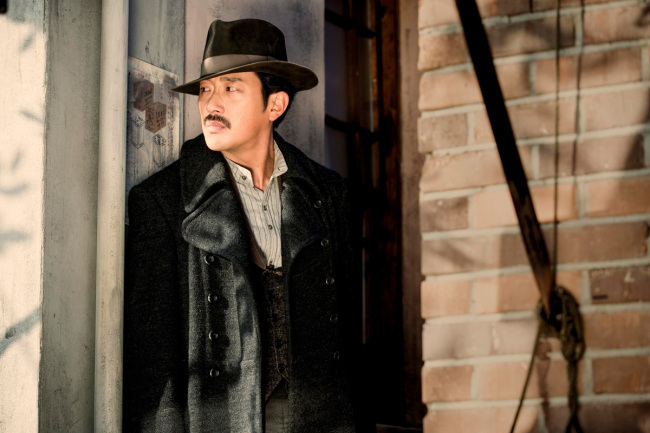 Ha Jung-woo has never been an actor to turn down a challenge. For “Kundo: Age of the Rampant” (2014), he shaved his head and played the part of a lowly 19th-century butcher who ferociously avenges his family. In “The Terror Live” (2013), he was an anchorman rigged with an armed bomb. “The Berlin File” (2012) transformed him into a deadly North Korean agent. Despite Ha’s chameleon talents, when director Choi Dong-hoon (“The Thieves”) tapped him for the film “Assassination,” he asked him to play a character that required hardly any acting. In the action-packed, star-studded “Assassination,” Ha plays Hawaii Pistol, a hit man who would kill anyone of any nationality for the right price. He takes a job to eliminate three Joseon (Korean) independence fighters who are planning an assassination attempt of their own on high-level Japanese figures. For “Assassination,” set in the dark era of the Japanese colonial rule, to be a commercial success, it had to find balance: the middle point between a heavy-handed story of patriotism and an irreverent lightweight. Ha’s character Hawaii Pistol was instrumental to finding that middle ground. Hawaii Pistol is the most cinematic of the characters featured in “Assassination,” always put together in his fedora hats, long trench coat and carefully groomed mustache. Although Hawaii Pistol is depicted as a character with no allegiances, throughout the movie it feels as if he is on the independence fighters’ side. Ha says that the feeling stems from the way he imagined Hawaii Pistol’s life. “Assassination” follows the story of three Korean independence fighters who are tasked with killing two key Japanese figures by a man with ambiguous loyalties, while being chased by a hit man themselves. It opened in local theaters Wednesday.